The fishing has been downright lousy here in Plum Island. Everything appears to be at a standstill. We’ve had all sorts of weather, west wind, east wind, pouring rain, clear sunny skies, and nothing seems to increase the number of fish around. Last night there were two keeper bass caught on the reservation, but these were very small, right at 28″ and only 7.5 pounds each. Dinner for 1 each. We’ve heard of no bluefish around either. Trolling swimmers, which usually can scratch up a fish or two has been unproductive too. Very frustrating. In the Parker river, off middle ground, there is a stacked up gang of baitfish, with birds whacking them and everything, but two days of trying scored zero fish. 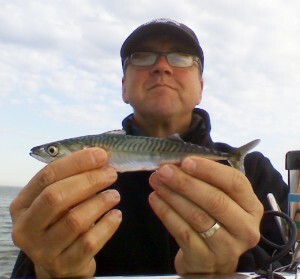 One bright spot this morning was stumbling upon topwater schools of mackerel. We followed a bunch of gannets into about 35 feet of water off High Sandy (this first big dune as you go south from the river). After a while we saw a patch of nervous water, hardly different from the light wind rippled water. First thought they were pogies, but after some concentrated snagging technique, jigged up two tinker mackerel. The schools were pretty big, about 30 yards wide, and every once in a while they would all jump. Live-lining the macks below the schools didn’t find fish. At least we had two fish on the boat. First fish in three days of trying. THOSE TINKER MACKS SHOULD BE MONEY! !